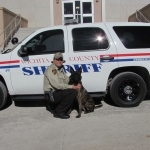 On Thursday March 12, at approximately 4:04 pm, Deputy Justin Mitchell made a traffic stop on U.S. 287 and Johnson Road. Deputy Gabriel Villarreal and his K-9 Partner Cane were requested to respond. Upon their arrival, Deputy Cane conducted an open air search around the vehicle. Deputy Cane indicated a positive alert for the presence of narcotics in the vehicle. 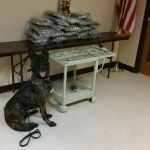 Twenty one pounds of marijuana, and $6,029.99 in currency was found in the vehicle. The 46-year-old male driver was placed under arrest. 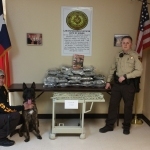 He was transported to the Wichita County Detention Center and was charged with Possession of Marijuana over five pounds under fifty pounds. Deputy Villarreal and his K9 partner Cane.